What? I seem so, what? I seem less talkative, less energetic, less happy. So why don’t you just say that? Asking me if I’m okay is telling me I don’t seem okay enough for you. Asking me what’s wrong is telling me you can start to see through the façade I spend so much energy daily constructing. It is not offering understanding or a helping hand. Rather, it is telling me the reality of my being sick makes you uncomfortable. Oh, and also, it’s my fault. Merry Christmas. You’re not satisfied when I assure you I’m okay. Sure, I could rattle off the diagnoses, but I know what comes next, and quite frankly, I don’t have the energy for the emotional labor of fending off forced sympathy that I didn’t want in the first place. So I summarize and say I’m sick. I say I’m preoccupied. I say I’m tired. All of these are true, and none of them tell you what is really going on. Pain is surging at the usual hotspots, my joints. It feels like each one has a funny bone that has just been hit with a hammer. A migraine heightens my sensitivity to the lights and sounds around me. The bones of my skull conduct the inward pain outward, like a copper panhandle, singeing my fingers when I rub my brow. My eyes feel heavy, they burn, and there is an annoying aura making it impossible to focus clearly. I feel mentally drained. It’s difficult to think, let alone speak, in complete sentences. This doesn’t stop my anxiety and depression from shouting pleasantries at each other inside my head, coming up with colorful slogans like, I don’t care about anyone, not even myself. I’m tired. I don’t want to do this anymore. How will things ever get better? “I’m not feeling well,” I offer. Yes, actually, hence the “chronic” in chronic illnesses. Whether or not you mean to, you’re saying, “You don’t seem sick most of the time. What is wrong with you now?” I am always sick. I try my very best not to seem so. All you’re doing is acknowledging that while I can try my best to pretend I’m normal, I can’t pretend away the very real impacts my chronic illnesses have on my life. I often get caught in a toxic cycle of overestimating how much energy I have and underestimating the effects of post-exertion malaise, a debilitating symptom of chronic fatigue syndrome, at which time your energy levels plummet and you’re left dragging your deadweight body hopefully to a bed where you can rest for several hours. As this isn’t always possible, sometimes I’m forced to interact well after my shut off valve has locked. It’s like gasping for air in outer space. To you, it probably looks closer to a mime suffocating in an imaginary box. Would it help you to understand if I lived in a hospital? Would a hospital gown somehow put all of this into perspective for you? Would it complete the picture accompanying my narrative? Would it still be a story you’d be interested in reading? 1. ACTION ALERT! Support Money Follows the Person through the IMPROVE Act! Advocacy needed to preserve one of our most important programs for supporting true independent living. A first step in holding airlines responsible when they damage wheelchairs and other disability-related equipment. A look back at the life and wit of one of the disability community’s most beloved, and greatly missed leaders. Action Alert: Support Money Follows the Person! 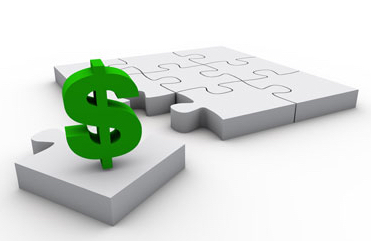 The Money Follows The Person program, (MFP), is about halfway to being renewed. The House passed it this week. Now it moves to the Senate, and we need people to call their Senators and ask them to support it. You can use this Action Alert from the American Association of People with Disabilities, (AAPD), by clicking this link. Please call now. This program is an important part of NCCI’s work! The main goal of providing services at NCCI is to assist individuals with disabilities, and others dealing with disability issues. Each person we work with has an individual story, and each person who achieves or maintains their independence is a win, for them and for all of us. Once in awhile though, it's useful to take a step back and look at what all of our services throughout the year look like. Exactly who are we serving? Which of our services are the most in demand? What kind of impact are we having in the North Country community? 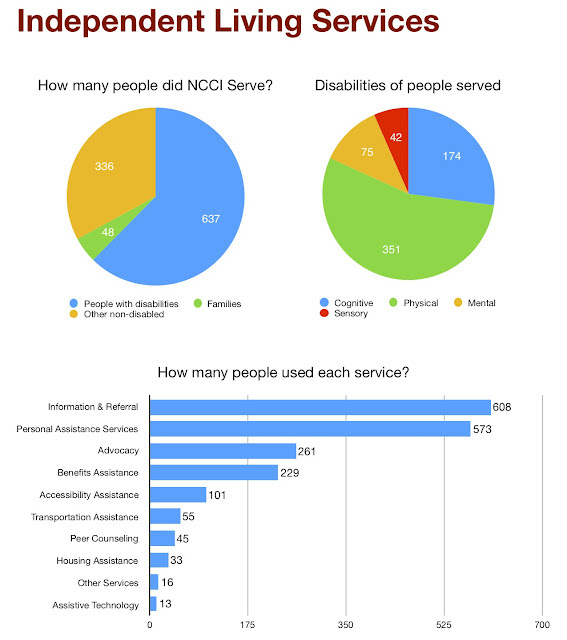 The graphics below show data on services provided by the North Country Center for Independence between October 2017 and September 2018. You can click on each graphic to see a larger, easier to read version. More details about President Bush’s role in passing the Americans with Disabilities Act. 2. Many of the dead in Camp Fire were disabled. Could they have been saved? Emergency response in disasters still tends to fail people with disabilities. Can we learn to make it better? An amazing photo essay … part of a long-term series of New York Times articles on disability. A good article on shopping and disability, in time for the holiday season. 3. Action Alert: Urge Governor Cuomo to Enact the Small Business Tax Credit! A rare opportunity to do something concrete to support more employment of people with disabilities in New York State. Action Alert: Urge Governor Cuomo to Enact the Small Business Tax Credit! The bill (A.1369/S.3688) to create a tax credit for small businesses who hire people with disabilities was delivered to the Governor on Monday. He now has 10 days to take action on the bill. Call the Governor today to urge him to enact the small business tax credit! This type of incentive, geared to small businesses, could go a long way to helping people with disabilities find gainful employment in New York State, and addressing the devastating rates of unemployment and poverty in our community. The NYS Employment First Commission's report included a recommendation to establish a cross-disability tax credit. While other tax credits exist, this particular opportunity is needed for the following reasons: 1) The Workers with Disabilities Tax Credit (WETC) is good for two years and only if you are a consumer of the vocational rehabilitation system seeking entry into the job market, 2) other tax credits are focused on individuals with particular disabilities identifying the need for a cross-disability application, and 3) small businesses are major employers in this state. ACTION! Call Governor Cuomo TODAY at #518-474-8390. Press 2 to speak with a person. Say: I am calling to urge Governor Cuomo to sign the small business tax credit bill! The tax credit created by A.1369/S.3688 would create an incentive for small businesses to hire individuals with disabilities, increasing the opportunities for New Yorkers with disabilities to achieve gainful employment and self-sufficiency. This Tuesday, November 27 is “Giving Tuesday” ... a day kick off the holidays by giving to your favorite charities. The Board and staff of the North Country Center for Independence is asking you to help with our mission to promote greater independence for people with disabilities in the North Country. 1. Make an online donation to our “Homecoming Fund” through GoFundMe. These donations will be used to help people with disabilities in the North Country move out of hospitals, nursing homes, and other facilities into their own homes. Funds are used to collect, store, and distribute home-making supplies like kitchen utensils, bedding, furniture, and adaptive equipment that often aren't covered by other disability support programs. 2. Sign up with AmazonSmile. Just register and designate NCCI as your recipient charity. Amazon then donates a percentage of all your purchases to NCCI. These donations cost you nothing, and do not change the price of your purchases. It’s a great way to direct resources to NCCI on an ongoing basis, but especially during your holiday shopping. There are formal and informal ways you can help NCCI with your time and talents. As a Long Term Care Ombudsman, you can help us advocate for people with disabilities in nursing homes and adult care facilities. 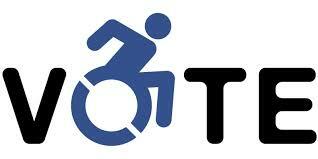 You can also help us document accessibility of area businesses as you go about your everyday errands. Or, you can help us assist people with disabilities working towards greater independence in our community. Anything you can do to help us out would be helpful, and greatly appreciated. Another guest post for our blog … a very relatable piece about the recurring dilemma of wanting to commit to things, while our bodies don’t cooperate. What do you think … is this a good idea? 3. What You're Saying When You Say "I Don't Need a Mic"
An important point about audio accessibility, for everyone who attends conferences, or organizes them. Usually I just lie. It’s not a matter of right or wrong, but rather a measure of how much damage will be done. In fact, the easiest way is to decline the invite in the first place. Having multiple chronic illnesses makes being unable to follow through with commitments not a question of if, but when and how often. When canceling, honesty is invariably met with skepticism and questions. Why open myself up to that kind of vulnerability? I’d rather be mistrusted for saying I’m sick for the second time this month than for saying I don’t feel up to a visit because I’m tired and hurting. Being sick is lonely. So you’d think being invited to hang out or do something fun would be welcomed, and most often it is. You’ll see a huge smile spread across my face as we talk about how we each have been. Maybe this even reinforces your confusion when I cancel our plans to go to dinner the following weekend. My life revolves around my body, in which there can be any number of flare ups at any given time, each with the power to upend my schedule. No number of good intentions can change the fact that some days I’m just a chronically ill person. Any other identity I manage to wear is temporary. So if I’m a friend, I’m a friend for a few hours. But I’m always sick. Yesterday, I felt strong and energized. I went shopping, walked my dog, cooked dinner, enjoyed a meal with my family, and washed the dishes. To do all of those things in one day made me feel like a superhero. But if I don’t get ample rest to make up for all of that activity, I’m a wreck. The contrast between yesterday and this morning is as sharp as the brightest and darkest brightness settings on your smartphone. I’m trudging through heavy sludge with every step; I feel insufferably sleep-deprived. An imaginary meat mallet is pelting me all over. I strain to concentrate long enough to think a complete thought. Getting together with a friend for dinner is out of the question. It’ll be a wild success if I take a shower and spend more time out of bed than in it. So I have to be flexible with my schedule and obligations. You see me on my best days, when all the stars align in helping me sell this narrative that I’m a seemingly normal young woman. The reality is I’m sick every day. Some days it’s with a migraine, other days it’s in the bathroom, still others it’s in debilitating pain from a fibromyalgia flare-up. More often than not, it’s all of these things. In fact, I only stop to catalogue my aches and pains when someone asks me why I can’t make it. Please accept that on my bad days, I can only take care of myself. And though I hate to admit it, even then I sometimes need help doing that. I’d love to see you. I only have so many good days, and I want to spend them with my friends and family. I also have obligations and a health regimen to stick to if I’m going to be well enough to fulfill as many commitments as possible. So I’ll settle for running errands, doing some pesky chores, spending time with friends and family, and walking my dog. Hey, wait a minute. That sounds awfully similar to the scenario that got me into this mess in the first place. I overdid it. And it’ll happen again. How people with disabilities are at additional risk in emergencies like the California fires. A good exploration of the issue of plastic straw bans. Exploring how parents approach raising kids with disabilities. Three election-related pieces for people with disabilities. A personal look at the critical link between health insurance stability and employment for people with disabilities. Looking at companies that go out of their way to hire and fully include employees with disabilities. Discusses the pros and cons of using “crowdsourcing” apps to map accessibility in cities and neighborhoods. Another NCCI blog guest post. This could have been written by someone here in the North Country! Growing up, I had this dream, this hope, in my mind of the kind of person I’d be despite any struggles I might face. I always hoped I’d be brave. Before I became sick, bravery used to mean something very different. It meant standing up for ideals, helping the needy and always being the bigger person. It meant accomplishing what I set out to accomplish, no matter how hard I had to work. I thought there would be no hurdle I couldn’t overcome with enough dedication, commitment and willpower. I grew up reading books about ordinary boys and girls defeating monsters and becoming heroes, and I’d be lying if I said I didn’t want to be the heroine in my own story. But what do you do when the monsters go to bed with you, wake up with you, eat with you and weep with you? How do you continue to be brave, every single day, when the fight is no longer a battle culminating in a glorious victory, but an extended offensive of attrition warfare? I’ve had to bury that dream, kiss goodbye those hopes, and console the sweet girl inside me who was innocent enough to believe she could take on the world’s problems when in reality I’m struggling just to manage my own. Because even on my best days, I am still bound to this body, and all I know is pain: relentless, all-consuming, unforgiving pain. Then there’s the mental anguish, the exhaustion, discouragement, frustration and sadness to reckon with. Not to mention the laundry list of other symptoms that keep things interesting. When you begin each day and sometimes each task with the prerequisite of having to talk yourself into fighting to live at all, it makes for a long day. I am alone in this fight, and yet I am never free from my monsters’ grips. They slither into the most intimate parts of my life and make a home, reminding me my body is the battleground in a war I fight behind closed doors. When I wake up in the middle of the night writhing in pain, when I cry upon waking at the thought of having to drag my tender body into the shower, when I sit on my bed and talk myself into taking my medicine, I am reminded that no one can take over fighting for me when I get tired. Pain is the loneliest company I’ve ever kept, but it’s loyal. Pain doesn’t discriminate. It doesn’t care what kind of day you’ve had or how much work you have left to do. And so I convince myself to carry on and forgive myself for the items I never seem to cross of my to-do list. Let’s face it. I won’t change the world. On my worst days, I don’t even change my socks. My disability took any last shred of hope I had that I would be brave enough to overcome my chronic illnesses and effect any real change in this world. My disability has forcibly flipped my priorities, leaving little to no energy for the dreamer in me who wanted to paint one small piece of the future. And so I tiptoe over the graves of the dreams I’ve buried along the way, and I hope somehow I make that little girl inside me proud simply for having the courage to keep going. Allison Jonergin is a SUNY Plattsburgh alumna and North Country native. She has fibromyalgia, CFS/ME and endometriosis. She also deals with irritable bowel syndrome, anxiety, depression and migraines. 2. 2 Weeks Until Election Day: ENGAGE YOUR FRIENDS AND FAMILY! 3. Break down barriers to voting with these tools! You can always contact us here at NCCI at 518-563-9058, for assistance related to voting. Via Norman Karp, Social Security figures and thresholds for 2019. “Awareness” can be a slippery and rather empty idea when disability is concerned. Click here for a PDF document that lists the new Social Security Cost Of Living Adjustment (COLA) for 2019. Here are just a couple of important numbers to notice for the Social Security Disability Insurance (SSDI) and the Supplemental Security Income (SSI) programs. There will be a 2.8% increase in benefits this year. I will keep everyone up-to-date as soon as Medicare releases their numbers for 2019. Non–blind: 2018: $1,180/m 2019: $1,220/m … increase of $40. Blind: 2018: $1,970/m 2019: $2,040/m … increase of $70. Individual 2018: $750/m 2019: $771/m … increase of $21. Couple: 2018: $1,125/m 2019: $1,157/m … increase of $32. Individual: 2018: $2,000 2019: No change. Couple: 2018: $3,000 2019: No change. The linked document goes into more detail about retirement, tax rates and other federal benefits. If anyone has any questions please don't hesitate to ask. You can call me at 518-563-9058 Ext. 110, or send me an email at: norman@ncci-online.com. Great election and voting resources for people with disabilities and Independent Living Centers. This is an attempt to address some of the most common barriers to voting for people with disabilities. Pretty gritty and real … but also kind of funny and in a way inspiring. How do I check my registration and register to vote? 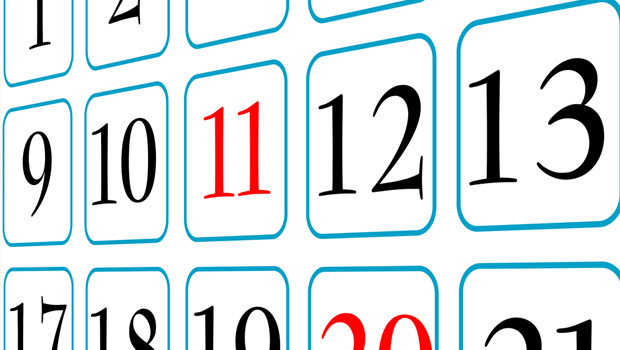 What is the deadline? - Click here for a website where you can check your registration status, and register to vote online in New York State. You can also register at most government offices, and at most human services agencies, including here at the North Country Center for Independence. Call us at 518-563-9058 if you want to register and need assistance. - The voter registration deadline in New York is Friday, October 12 for the 2018 Midterms on November 6. Click here to see the registration deadlines in all 50 states. I don't drive or have a car. How am I supposed to get to the polls? - The first step is to make sure you know exactly where your polling place is. Click here for a website where you can find out. - Is it close enough to walk or wheel to? Could you afford to take a cab, just that once, to cast your vote? Call your county transportation department and ask if there is wheelchair-accessible transportation that can take you to and from the polls. You can also call your local Democratic or Republican Party, (whichever you prefer), and ask if they can help you get to the polls. - If getting to the polls is going to be difficult in any way, it’s best to plan as far ahead as possible so you can make arrangements. Why is polling place accessibility important? Can't disabled people just vote absentee? - In NYS, most people with disabilities can get an absentee ballot if they want one. This allows you to cast your vote by mail. And absentee votes are just as valid and counted as votes cast at the polls. 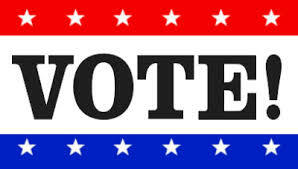 Click here for more information on voting by absentee ballot in New York State. - However, many people prefer to go to their local polling place to vote, the way most voters do, and they have a right to do so. People with disabilities also have an equal right to an accessible polling place where they can independently and privately cast their ballot. All polling places in New York State should have a way for people with mobility, motor, visual, or hearing disabilities to cast their vote. - If you choose to have someone help you with the voting process, you may. But you cannot be forced by someone else into having help to vote. Aren't there certain kinds of disabilities that make it impossible or inappropriate to vote? - In the United States, you don't have to demonstrate any particular level of knowledge or understanding to be eligible to vote. You just have to be a United States citizen and 18 years old or over. That applies to everyone, including people with all kinds of disabilities. - NYS Law allows judges to rule a person with cognitive disabilities ineligible to vote when it is part of a legal guardianship. However, it is not an automatic part of every guardianship, it can be reversed and voting allowed if appealed, and in general, people have a right to register regardless of their disabilities unless specifically deemed ineligible by a judge. - The vast majority of people with disabilities are as capable as anyone else of making their own voting decisions. I don't know much about politics. Wouldn't it be kind of wrong for me to vote? - One of the core principles of democracy is that you don't have to have a certain level of knowledge or intelligence to have a meaningful right to vote. If your vote isn't especially informed, and cast more on instinct, it is still valuable, and your insights are no better or worse than those of other voters. - That said, if you feel like you would like to be more knowledgeable, you can change that. You can start by visiting websites about the 2018 Midterm Elections, and then visiting the websites of candidates who will be on your ballot. Why is it important for people with disabilities to vote? - People with disabilities are a potentially huge voting constituency. Almost 16 million people with disabilities voted in 2016. Recently, major elections have come down to thousands of votes. In local races, hundreds or even handfuls of votes can make the difference. - In 2016, 68.3% of voting age people with disabilities were registered to vote, compared to 70.6% of non-disabled people, a 2.3% gap. 82% of registered disabled voters actually voted, compared with 88% of non-disabled registered voters, a 6% gap. (Source: Lisa Schur and Douglas Kruse, Fact sheet: Disability and Voter Turnout in the 2016 Elections). - Just about all disability-related policy is affected by who is elected to Congress, state legislatures, counties, towns, and village offices … including the scope, quality, and funding of Medicaid and Medicare, Social Security, SNAP and housing assistance, home care, developmental disability services, independent living centers, and civil rights laws like the Americans with Disabilities Act and the Individuals with Disabilities Education Act. - Who knows better how these and other disability programs should be designed and implemented. Very few lawmakers really know the disability experience. They rely on us not just for our votes, but for our everyday expertise on disability issues. We have the numbers and the knowledge to make a difference. But potential alone doesn’t do anything. First we have to follow through and vote. 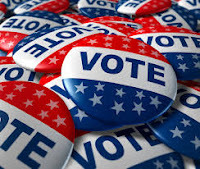 The National Council on Independent Living has resources for voters with disabilities. Click here to visit their page. You can also check an analysis of the races for Congress, every day from now until election day, at these FiveThirtyEight.com pages: Senate Forecast - House Forecast.